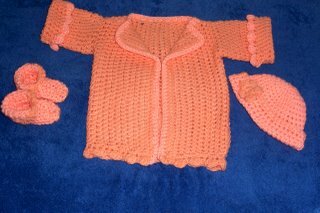 Ahhh... peaches...the fresh color is so invigorating... this beautiful layette is trimmed in a lighter shade of peach with scallopped trim on the sleeves and bottom of sweater... and a flower added to the hat. I have no interest in sewing but yet again I am on the side blogs where everyone is so talented that it gives me a complex. On the side note, the color of the sweater is very pretty.